You are playing in a multiple deck game where the player option of soft doubling is allowed. 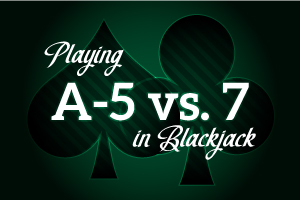 You are dealt an Ace and a five, while the dealer gives himself an upcard of seven. You're in no immediate trouble of busting if you choose to hit here. So from that particular standpoint, you're safe. But obviously, when you have soft doubling available, you're always going to be on the lookout for the right opportunity to exercise the option. Does this case present one of those opportunities? Actually, it doesn't. You must hit this hand. Do not double under any circumstances. Remember that the Ace-five presents you with the total of 6 or 16. There's really not a great deal of power there, because neither of those totals gives you a lot of leverage. Certainly, it's not a hand that's strong enough to go in with a double against the dealer's seven. Broken down mathematically, doubling on this hand produces a negative expectation. You will, in fact, lose over nine more hands per hundred than you will win. That presents about a 20% deficit, and of course, that's not good. On the other hand, when you simply hit the Ace-five against the seven, you're actually going to be in decent shape. Putting all pushes between the player and dealer aside, you will win and lose almost exactly the same amount of times when you hit. That's basically a break-even proposition, which is a much better alternative than doubling here.